What Is the Best Gluten Free Pasta? What is the best gluten free pasta is one of the questions I get asked most often from readers and those new to gluten free eating. I talked about gluten free pasta shortly after I went gluten free, but after being gluten free over four years now, I have a few more thoughts on gluten free pasta. So, I thought it would make a great post and a fun ask the readers question. When I first went gluten free I loved Tinkyada brown rice pasta. The main reason I liked it was that it was the easiest gluten free pasta for me to find at the time. The taste and texture were good, so that was the gluten free pasta we ate most often. Over the last few years more and more gluten free pastas have become available and I find myself buying Tinkyada less and less. I still think it is a good gluten free pasta, but my family has found other brands we like more. For the question what is the best gluten free pasta, I am not sure there is a one brand or one type answer. For my family it really depends on what I am using it for. For baked pastas or spaghetti pie, I like the ones that are corn based like Sam Mills, Ronzoni, or Heartland. For homemade macaroni and cheese, we like Heartland, Sam Mills, or Tinkyada. My current favorites for spaghetti are Heartland and Ronzoni. I recently found the gluten free orzo in the picture above at Wal-mart and can’t wait to try it. I have several orzo dishes that I used to make that I am looking forward to having again. I have yet to find a gluten free lasagna noodle that we love. I really wish that Sam Mills, Ronzoni, or Heartland would make one, because their pasta work well in baked pasta dishes, but so far I don’t think any of them have. If you have a gluten free lasagna noodle that you like I would love to hear which one it is. I also have a couple of tips for cooking gluten free pasta. Most gluten free pastas are better when rinsed after cooking. My family thinks it helps the texture a lot. I just do a quick rinse in the strainer after I drain the cooking water off. Not long, just a quick rinse, swirl it around, and drain. There is also a fine line when cooking gluten free pasta between not done and over done. So, don’t look away for long when cooking your gluten free pasta. Test occasionally throughout the cooking time because it really does vary with the brand and type of pasta. Now that I have shared a few of my favorite gluten free pastas, I would love to hear yours. 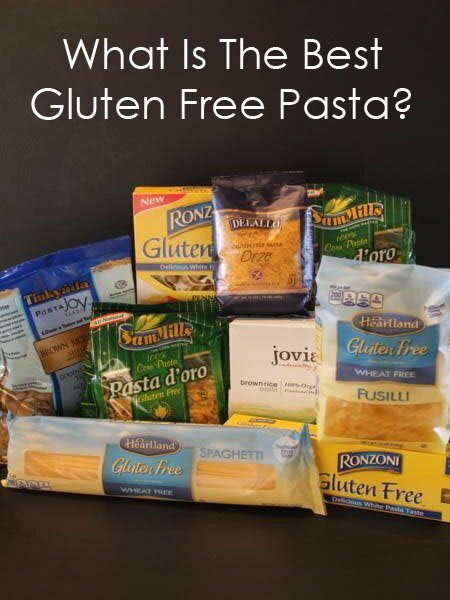 What is your favorite gluten free pasta? Or pastas if you are like me and have more than one favorite. I have several Walmarts that are near me and they have all started carrying more gluten free pasta and I love that they are doing that. Most of what I have in the picture of this post I bought at Walmart. Thanks for sharing your favorites! My family prefers the Ronzoni. I’m the only GF one in my house but my daughter & husband are pretty supportive 😉 They both said that they couldn’t tell this was GF, that it tasted just like regular. I have not seen the GoGo Quinoa pasta here in the US, but it sounds good. I will have to look for it here. Thanks! My favorite so far is Trader Joe’s gluten free pasta, I tend to enjoy the Brown rice pastas the best! The DeLallo orzo are very good. My kids love them! DeLallo GF gnocchi are amazing! We also love BiAglut penne, rigatoni, & fusilli, and Bionaturae elbows & fusilli. I have not seen the gnocchi by DeLallo but I will have to look for it. I don’t think I have seen BiAglut or Bionaturae but I will have to look for those brands. Thanks for sharing your favorites! The only place I have seen the gnocchi is at The Fresh Market. I buy Bionaturae at Whole Foods or from amazon, and the BiAglut, from amazon. BiAglut was recommended to me by the owner of Gluten Free Zone in Pittsburgh. He told me it’s the best GF pasta he has ever tried and his store has an amazing selection. Based on his recommendation, I tried it and was really impressed. It’s the main brand I use now. They make Stelline, which is a great soup noodle, and lasagne noodles, which I have, but haven’t tried yet. My kids and husband wouldn’t eat Tinkyada, the first brand I bought after my Celiac diagnosis. It’s nice to finally have found some brands of pasta that my gluten eaters love as much as I do. We prefer Tinkyada and Jovial because they are healthy options. The corn based pastas are firmer and cheaper, but they are no healthier than the ‘enriched macaroni product’ that non-celiacs or gluten intolerant folks eat. If I am going to serve pastas to my family, I want them to be a healthy variety. I wish the quinoa pastas were not a mix of quinoa and corn. I’ve been gluten free for almost 4 years , the best lasagna noodle is Tinkyada hands down. I’m a fan of of the brown rice pasta under the Trader Joe name. After the Tinkyada experience, we feel T.J. pasta cooks up more like a gluten pasta (although, using the short-cook method with Tinkyada, I will still use it for the shapes I can’t find otherwise, e.g., elbows.) Not overcooking g-free pastas seems to be the key as to whether or not it’s well received here. Also, I had some leftever plain brown rice pasta that made an awesome base for a black bean Mexican “spaghetti” sauce. Being rice, it can easily go either way! I will now make this dish intentionally! Thank you to everyone who has added comments with brand names I’ve not seen before! I’ll be on the look-out now!! I really like that orzo myself; great in some of my recipes that used wheat orzo. I also like Bionaturae which is made with rice, potato and soy, it doesn’t get too soft in dishes and the flavor is quite good, they made spagetti and a radiator pasta that is lovely in salads. Have you tried the new Barilla gf spagetti? I am longing for gf tiny star pasta and linguine pasta…. I have not tried the Barilla gf spaghetti. Where did you find that one? I don’t think I have seen it in stores where I am. I live in the Lehigh Valley in Pennslvania. Giant grocery stores carry it. I think it is fairly new. Maybe if you ask your local grocery store they will get some? I think there are 3 box shapes (penne, elbow and one other shape) plus the spagetti. It is cheap compared to most other GF pastas and I am quite taken with it! By the way I totally agree that GF pasta goes from undercooked to overdone in a moment. Really suggest that you take it off while it is still feeling slightly underdone and toss with the sauce for a minute and that should finish off the cooklng process. That is how the Italians have always done it! We have Barilla in the NW and I am partial to it. We have it a lot with pan fried chicken breasts and I agree with taking it off boil early since it does still cook a bit more after. We like the texture, that it holds up well, not mushy like many rice-based pastas that I have tried. Has anyone found a gf “bowtie” pasta? Is it good? I have not found one, but Sam Mills has one they call Lasagne Corte that is like a really small lasagna noodle and is about the same size as bowie so I use in in recipes that I used to use bowtie in. At Walmart today I noticed Heartland does make a lasagna noodle!! So happy about that! Oh I am so excited. I hope my Wal-mart gets them soon! Thanks for letting me know. I too buy different brands depending on what I’m making. My store carries a lot of Schaar and in a lot of instances is my go to. I’ve switched to Ronzoni in most cases simply due to the cost. My question is, has anybody found a GF pasta that works with cold pasta dishes like a pasta salad? I’ve found that the pasta salad tastes good to start with but after a day or two the pasta is really hard almost like it wasn’t cooked. Suggestions? I agree with you on the pasta salad. I like the corn noodles best for it, but I agree that after a day or so, the texture just isn’t right on it. Either it gets really soggy and mushy or like you said it gets hard. I just usually make enough for what we need that day instead of making a bunch or making it ahead. Maybe some others will have some thoughts on that too. I found a pasta that works with a cold pasta salad. It’s actually a fresh pasta found in the refrigerated section. It’s called PR’s is and is made out of Madison, WI. I made pasta salad on Monday (made the pasta the morning of) and eating the left overs now and the pasta is still soft! I just tried Sam Mills corn penne and thought it was awesome!!!!!!!!!!! is much more expensive. Is that more heather than having the corn pasta. The Ancient Harvest quinoa pasta is my favorite. I get it at Whole Foods. Good texture and no aftertaste like some of the rice, corn pastas. In my opinion, it is the closest experience to a wheat pasta. The one drawback, it doesn’t re-heat well for leftovers. I’ve tried a lot of quinoa and corn based pastas, but the texture is just too grainy. The best one I’ve found is the brown rice penne and fusilli from trader joes. My boyfriend’a Italian grandma had some and she couldn’t tell any difference. I hope my Walmart starts selling it soon. I have not seen it, but can’t wait to try it! We found Heartland lasagna noodles at our local Walmart-they’re with the regular pastas. We enjoyed them and they’re no boil needed so that makes them easier to prepare. I hope my Walmart starts stocking those soon! I keep hearing how good they are so I can’t wait to try them. I am new to the disease of Celiacs! I found this very helpful! I recently found that Barilla makes a spaghetti pasta & I love it! It can be hard with those “textures” when it comes to gluten free pasta! Thanks for your article! So far I have found that Jovial pasta tastes the closest to real pasta! The orzo is great in soups. Bio nature is the best spaghetti I’ve found! I am Italian and a pasta snob. Prior to going GF about 10 months ago (still suffering from withdrawal from ciabatta bread) DeCecco pastas were the only bought pastas that could be found in my cupboard. Finding a comparable GF pasta has been virtually impossible but I have found what is closest to my taste. Those I have tried are Ancient Harvest (poor), Delallo (better but not great) , BiAglut (getting there), Andean Dreams (home run). Andean Dreams pastas have two ingredients, rice and quinoa flours, that’s it. If cooked al dente (preferred) it hold its shape and remains firm and has a near DeCecco pasta taste. It is not perfect but it’s the best tasting to my palate and has the best consistency. It also has the highest protein content of any of the above brands at 6gms/serving. The BiAglut (mostly corn and potato flours) weighs in at just 3 gms/serving of protein. Pasta is already a heavy carb dish so when I can get a little boost in protein and top taste I have to go out of my way to get it. That is the issue…very tough to find, I get it at my local Co-op in Pittsburgh (East End Co-op). Very few other stores carry it. If you can get it you won’t regret it. Thanks for sharing that. I will have to look for it! I have enjoyed the corn pastas made by several different companies like you pictured above. However the kids don’t like and I don’t like the rice pastas. Found a really good compromise in Barilla pasta. Made with both corn and rice. Farmo makes a good corn pasta. They have several different kinds of pasta that you cannot find in Heartland and Delallo, etc. The other brand I have used and like is Le Veneziane. They have what looks like linguine shaped like a birds nest, Ditalini, Gnocchi, Rigatoni and several others. I have found both in health food stores and on Amazon. Le Veneziane is kind of expensive so only do for special dishes. Both are corn pastas and cook up very well. Make mac & cheese with Barilla elbows and reheat the next day and it isn’t mushy to me, however, I do need to add a little more cheese. I agree we tried the Barilla and really like it. DeBoles GF lasagna noodles are really good and you don’t have to precook them. The only trouble is they are more difficult to find. I have to go to a specialty grocery store. I use Jovial lasagna noodles and do it as a no boil lasagna. Tastes very close to “real” pasta. My husband has celiac and I have been cooking gluten free for about 5 years. Gluten free pasta has changed a lot in this time. We love Sam Mills pasta. I am asymptomatic celiac diagnosed September 2014. I am still finding my way. Pasta was my life. I have tried a number of the gf pastas out there including Tinkyada, Bionature, ancient Harvest, Ronzoni, and Barilla. I was at Disney recently and had LaVeneziane. My favorites are Barilla, Ronzoni, and LaVeneziane. I’ve only made one lasagna since being diagnosed. It wasn’t very good. I need to try again but with just a small amount or do roll ups somI don’t waste all the ingredients if it’s a flop. I have not had LaVeneziane, but am glad to hear that it is good. I have had trouble too getting a good gf lasagna. There is something about the lasagna noodles that don’t work quite the same. I have found great gf pasta, just not a lasagna noodle I like. have you found a pasta that will work for cold pasta dishes like pasta salad? The only one that we tried got very grainy when it was cooled. I have not found one I love for pasta salad type dishes. Heartland is the best I have tried so far and is usually what I use when I need something for a cold pasta dish. I’ve been using Heartland Gluten Free Oven ready Lasagna for a little over two years now, it’s the best I’ve tried so far . I couldn’t tell this was gluten free pasta in the lasagna , it set up really well . Before this I just used zucchini noodles which was great as well . I love the Heartland gluten free pasta, but have never seen the lasagna noodles. Where do you find it? I was diagnosed with Celiac two years ago and have struggled to find a “good, great-tasting” Gluten-free pasta. I have tried many brands with a hit or miss, mostly misses. My husband and I had our first shopping experience at “Trader Joe’s” a few weeks ago. I bought two Gluten-free pastas – willing to taste test some more! I made Trader Joe’s brown rice pasta the other night and could not tell it from real pasta. It was so awesome I wish I had bought more. Unfortunately, Trader Joe’s is over an hour away, so I have to plan our trip in advance. I would buy a dozen of this brand if the store was a lot closer to my home. I wish we had a Trader Joes where I am at. We are supposed to get one soon, but it will still be like 40 minutes from me. Their pasta is one of the things I hope to try! My favorite gf pasta is Andean Dream for stove stop for baking its Jovial lasagna noodles. Hello, Heartland used to make a GF no boil lasagne noodle, but I have not been able to find it for years. Their website does not show it either. I used to use it and liked it much better than Tinkyada, so did my family. Maybe if more people are asking about it, they will bring it back. Used to be sold at Wal-mart. I have heard that they make it, but I have never seen it. I love their gf pasta, so I wish I could find it. You may be right though and they might not make it anymore. We are still able to get the Heartland Gluten Free Oven ready lasgna noodles at our walmart in Festus, Mo. Just made some about 2 weeks ago. I’m not sure why their website doesn’t show it as it is apparently still available. I hope they will keep it and start selling it at more Walmart stores. I love the heartland gf pasta so I am sure there lasagna noodles are good. I keep hearing good things about them. We use Pasta Riso which we buy by the case at Amazon. The brown rice rigatoni and elbows are particular favorites. We also buy the corn pasta at Aldi and Walmart. The guys seem to like the corn pasta the best, while I like the brown rice varieties. I do think the corn pasta reheats better than the brown rice which can get mushy. I have not tried the Aldi pasta but need to. I am glad to know that it is good! And I agree the corn pastas seem to be firmer and hold up better for reheating, etc. http://allrecipes.com/recipe/23600/worlds-best-lasagna/ This is the absolute best lasagna I’ve had since going gluten free. I use Tinkyada lasagna noodles. I never precook them which makes this easier. I have served this to many gluten eating people and they all love it. This sauce is sooo good you don’t even get a funny taste from the noodles that I have always noticed with corn pastas. We have tried a lot of GF pasta over the past ten years and we all really like the Ronzoni products and they are een edible in a pasta salad the next day. One of our new favorites is Le Veneziane, which I buy from Vitacost.com. It was the brand of dry pasta being used at most of the restaurants we ate at in New York City. Amazing, and no need for a cold rinse. The rigatoni, penne, fettuchini, and ditalini are my favorite shapes. Gluten Free Barilla Pasta is great! Its only is available in a few pasta shapes but I really like the texture it reminds me of regular pasta. The pasta tastes great even cold in pasta salads which some gluten free pastas tend to get too firm and dry in the fridge. The only place I can find it is Amazon online or SuperTarget locally. I like Ancient Harvest Quinoa gf pastas the best. The only gf lasagna I’ve found is De Boles which I thought was really good for a rice pasta. I find that Barilla gluten free pasta is best by far. I really love the Ronzoni Penne Rigate for homemade Macaroni and Cheese! My daughter doesn’t even need to watch her gluten but she loves these noodles in Macaroni and Cheese! I use an extra sharp Cheddar, homemade white sauce made with gluten free flour, oh so yummy!!!!!!! I recommend this highly! I have not even tried a gluten free lasagna noodle yet. I use the Penne Rigate noodle for everything!!! Good stuff! Thank you for your post!!!!! Just tried Simply Balanced no bake lasagna noodle sold in Target very good . I felt like I was eating the real thing again. Can’t always say that! I have not tried that brand. I will have to look for them. I am glad to hear they are good! My family will eat gluten-free with me if I use the Ronzoni or Heartland corn pastas. They taste better and have a better texture than any others we have tried. I like Bonta d’Italia brand tagliatelle pasta. My favorite is GF RP pasta. It is fresh and wonderful. It was at Costco for a short time a few years ago but I didn’t know they had it (because who checks with the refrigerated pasta when you know you can’t have it). Now I have to drive 2 hours to buy it. They do have lasagna sheets but the store I go to doesn’t have them. I like quinoa pasta if you are talking dry pasta. Heartland spaghetti is the best! I s is an old post, but Muellers has come out with GF macaroni and lasagne noodles that work REALLY well in baked dishes. The macaroni actually held up to 2nd day servings of pasta salad. No half disintegrated mush! I will have to try that brand. Thanks for sharing it. This might be an old post, but I still love getting comments on it because there are so many brands of gf pasta out there. I have tried many GF pastas in the past six years that I have been GF. I prefer the pastas that are have both rice and corn flours in them. Heartland is very good as well as Ronzoni (which also has quinoa). My family can’t tell I’m using gluten free when I make the ones with corn & rice. I agree we love Heartland. I was diagnosed with Celiac about 3 years ago. I have found that the best for my house and taste buds have been Barilla or Ronzoni!! I have tried others, but my husband who is not Celiac does not care for them. He will eat the Barilla and Ronzoni. We feel they taste the most like wheat pasta. Thank you for all of the other great tips for pasta out there. I live near the Lehigh Valley in PA and found that my walmart carries a lot of gluten free pasta’s. I would love a great lasagna noodle. Looks like we still might be searching. My mother just told me yesterday that our local butcher has now started carrying a bunch of homemade Gluten free items in the frozen section, including GF Ravioli’s. ill be headed there this weekend to test them out. Happy Pasta eating everyone. I didn’t get a chance to read all the comments but wanted to add our favorite. It is Le Veneziane gluten free corn pasta from Italy. It tastes the same as our previous wheat pasta. We order it on Amazon because I haven’t found it in any stores. Thanks for the post it is interesting. There is a great Lasagna noodle with a nice texture from Gluten Free Cafe. It’s delish!! I would love to hear how your orzo recipes turned out. I just found it in my area and I’m so excited!! I actually find Barilla to be the best pasta. They have spaghetti, penne, elbows and…….lasagna! I will say actually finding the lasagna noodles is a bit taxing. I consistently use the spaghetti and penne for usual night dinners. All I do is boil the water before. Cook for 11 minutes and done! I also only use a wooden spoon when cooking and leave it in the pot while it cooks. The water comes out less starchy and the noodles don’t clump together (had this issue with other brands). As far as the elbows I make macaroni salad and no one ever knows it GF until I get some too. I cook exactly the same as spaghetti except I cook for 12 minutes. I find the corn/rice combo of Barilla to be closest to normal pasta taste. I enjoyed your post, hope this helps with mission find lasagna noodles! I have not seen the Barilla lasagna! I will have to look for it. Thanks for sharing your thoughts on it. I have found that Catelli makes a good GFree lasagna noodle. I really want to find a great GFree pasta for Mac and cheese…I really miss that comfort food. Tried some the other day using Catelli Gfree macaroni but it disappointed. Have tried many other brands however no luck yet. Great article. Loved the update on gf pastas. We are frustrated also with lasagna. Once I baked them raw (Tinkyaya) SP. Turned out hard in the middle. I think if the sauce was more watery and I baked a little longer might work. Tried low simmer of quick boil. Turned out like mush. I think a noodle less thick raw with watery sauce could work. The sauce should thicken with by what the noodles give off. Longer baking time would mean veggies should be raw too. Also use rice noodles from Asian grocery. Cook on low heat. They have a wide noodle that is great for linguini. They don’t say gluten free so if you are severe it could be a gamble. Make great linguininclam sauce. I love using asian rice noodles in soup. They work great. Heartland Gluten Free Pasta, that you can find at Walmart is my favorite for pasta salad. I hope that helps. My favorite gf pasta is barilla…it tastes/texture is just like regular pasta…my husband had no idea I was giving him gf pasta! We like the Tinkyada for lasagna noodles. I find for cold pasta salads we prefer Barilla. I don’t know if this site is still active, but I’d like to add my two cents’ worth. We discovered Veneziane pasta while living in Italy. It’s the best we have come across; we get it for my wife but I honestly can’t tell it from regular pasta. It was hard to find in the states, but we have been getting it from a mail order house. We’ve tried Barilla, and it seems pretty good as well. I look forward to the day when all the various types and shapes are available gluten-free. I have heard of that pasta from Italy from others and wish we could get it here! I agree about Barilla. It is one of the better gf pastas. And I also agree that I look forward to the day when all types and shapes of gf pasta is available! I’ve had good success with making lasagna with the GF noodles from Walmart and from Jovial. However, I don’t pre-cook the noodles. I leave the sauce a little saucier than I normally would, and I put the noodles in the lasagna dry and cook it covered for 3/4 of the cooking time. I make a one pot pasta that I don’t cook the noodles for either and it works great. I have not tried it with gf lasagna though. I will have to try it that way. I am glad to know that it works. I’ve been gluten free for about 25 years and always found pizza and pasta, along with bread as the most challenging parts of the diet.. I ordered gluten free pasta at a restaurant and it didn’t taste gf at all. I sent it back. The chef came out with the package. It was LaVenezia gluten free pasta. OMG, I kept going to the restaurant for the pasta. My daughter said why don’t you order it online and I have been doing so since thru Amazon prime. Relatives who don’t have celiac disease are now eating it by choice. Awesome! Several readers have mentioned that brand and I need to order some of it to try! 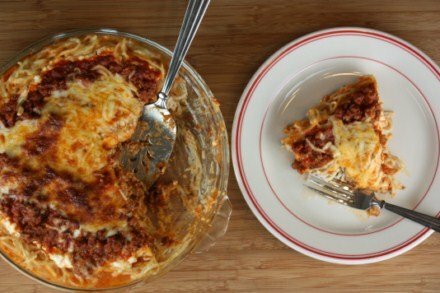 Tinkyada lasagana noodles have worked great for me – I have a no cook lasagna recipe and my family didn’t notice the difference and raved over the meal like usual. My current favorite is Andean Dream Quinoa pasta. No corn. All quinoa. Cooks up terrifically. They have pastas and orzo. The only lasagna noodles I know of is Tinkyada. Going check that La Venezia. I like Heartland the best for gf pasta salad. I get it at Walmart. I usually rinse it after I cook it for pasta salad. I hope that helps. I recently found Heartland Gluten Free Oven-Ready Lasagna. Best I’ve found so far. It held together much better than other pasta I’ve tried. Pretty sure I got it at Walmart. Has anyone tried chickpea pasta? Also, who sells Sams Mills? I have found Sam Mills at several different Walmart stores in their gluten free section. I have also bought it from Amazon. I have not tried chickpea pasta. I am not a huge fan of chick peas, so I was worried about the flavor of it. I have heard a few people say they like it though. If you try it I would love to hear what you think.